Re-indexing the database essentially tidies up the database structure. Small practices should reindex monthly, while bigger/busier practices should update weekly. 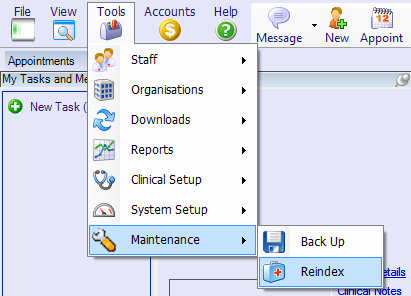 Go to Tools >> Maintenance >> Reindex. This process can also be automated. Please contact the helpdesk to arrange this.